Bread fruit is a tropical fruit and a nutrient source of starch and Vitamin-B. 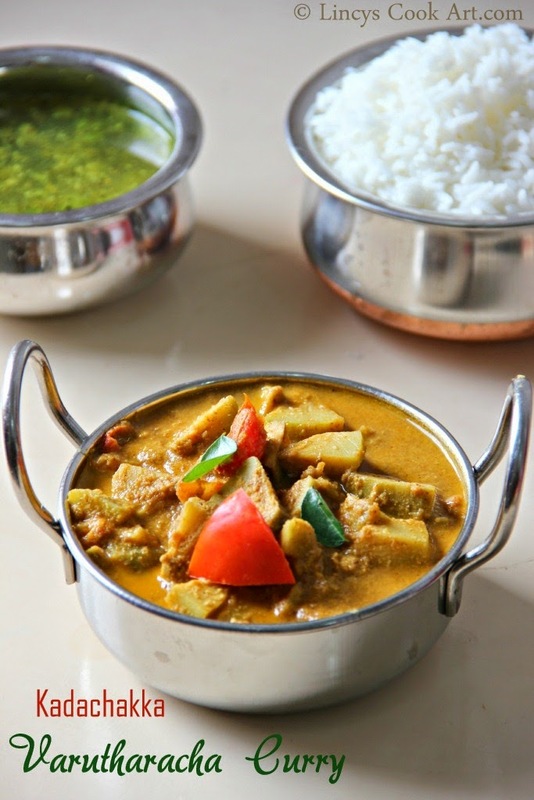 Kadachakka or Breadfruit Varutharacha curry is an easy to make curry. Tastes like non veg preparation. Yummy curry with succulent bread fruit pieces tastes really nice when served with plain rice. Can be eaten as a side dish for rotis and parathas too. Easy to make tasty side dish flavoured with garam masala, roasted coconut and curry leaves. Simple yet delicious dish. Totally a different fruit/veggie from normal carrots,beans, potaoes, cauliflower..etc. You can try this curry for a change.You can prepare this for the guests also. They will also appreciate your curry. Do try this curry. Heat oil in a pan and add fennel seeds, onion, green chilli & garlic. Saute till soft; add coconut and roast till light golden colour. Add chilli powder, coriander powder and garam masala; saute for fifteen seconds and switch off the gas; allow the mixture to cool. Grind this mixture as a fine paste. First powder the mixture then add water and grind as paste. Remove the bread fruits skin and midrib; chop into small pieces. Add the above above ground paste, tomato and curry leaves,1 1/2 cup water and salt if needed. Cook till the gravy thickens and the colour turns darker when the gravy thickens. Notes: While removing the skin, milky latex will lightly ooze out. Do not worry about that. If it sticks to your hand you can remove the latex by rubbing hands in oil then washing hands in soap. Delicious gravy , have to check what is breadfruit. And then make this. yummy My mom used to make it kadachakka theeyal! It looks like small unripe jack fruit. Have updated a photo of bread fruit please check. We too make it this way. It tastes awesome..
Never cooked anything with breadfruit, curry looks fantastic.